When it comes to food, my weakness will always be fried chicken and I have been lucky enough to travel the world sampling each culture’s tasty version of the fried bird. So you can imagine my delight when I visited a local Thai and Vietnamese restaurant here in Malaysia and came across this concoction. 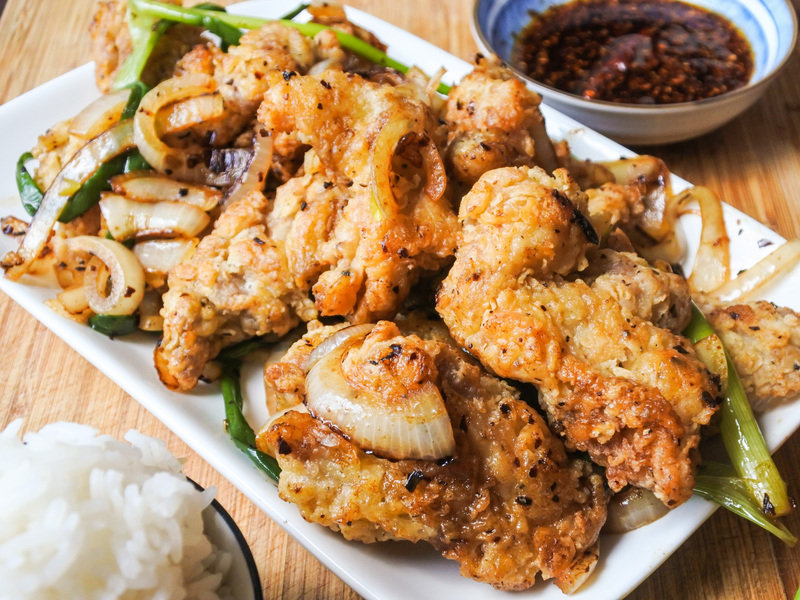 Dark chicken salted, battered and fried then tossed with onion, scallions and fresh chopped chiles. Needless to say, I was smitten. I mean, who wouldn’t be in love with that combination of flavors and crispy chicken? Mix 1 tablespoon of sea salt with 1 tbsp of sugar and mix until thoroughly combined. Sprinkle both sides of chicken chops with the salt sugar mix. Place over a grate or sieve with a container underneath to catch the liquid that drains off. Chill in the refrigerator for 2-5 hours. When ready for cooking, rinse chicken with water in order to remove excess salt and sugar. Drain excess water off and pat dry with paper towels. Cut into pieces no bigger than 1 in/ 2 cm squared. In a large mixing bowl, combine flour, cornstarch and black pepper. Mix until thoroughly combined. In a separate bowl, beat 1 egg with 2 tbsp of water. Dip chicken pieces in cornstarch/flour mixture, then beaten egg, then flour once more. In a large frying pan or wok, heat a generous amount of oil over medium high heat. When oil is hot (you’ll know if you drop a little bit of batter into it and the oil bubbles around it), shake excess flour off meat and add chicken. Keep oil hot but not so hot that the outside burns before the center is cooked. Keep the oil at a steady medium high heat with a fairly moderate bubble. Nothing too hot or with a furious sizzle. When chicken is golden brown on all sides (about 5-7 minutes), remove from oil and drain excess oil on paper towels. Meanwhile, heat 1 tbsp of oil in a large wok over high heat. Add chopped chiles, scallions, and sliced onion. Mix and stir fry for a minute, then add fried chicken pieces. Stir fry for a minute together, then turn off heat and cover. Be careful of the fumes given off from the fried chiles. Before serving, drizzle with 1 tbsp of fresh lemon juice or vinegar (optional). Toss until evenly coated then serve. Mix 1 tablespoon of sea salt with 1 tbsp of sugar and mix until thoroughly combined. Sprinkle both sides of chicken chops with the salt sugar mix. Place over a grate or sieve with a container underneath to catch the liquid that drains off. Chill in the refrigerator for 2-5 hours. When ready for cooking, rinse chicken with water in order to remove excess salt and sugar. Drain excess water off and pat dry with paper towels. Cut into pieces no bigger than 1 in/ 2 cm squared. In a large mixing bowl, combine flour, cornstarch and black pepper. Mix until thoroughly combined. In a separate bowl, beat 1 egg with 2 tbsp of water. Dip chicken pieces in cornstarch/flour mixture. Then in the egg mixture. AND back into the flour once more. In a large frying pan or wok, heat a generous amount of oil over medium high heat. When oil is hot (you’ll know if you drop a little bit of batter into it and the oil bubbles around it), shake excess flour off meat and add chicken. Keep oil hot but not so hot that the outside burns before the center is cooked. Keep the oil at a steady medium high heat with a fairly moderate bubble. Nothing too hot or with a furious sizzle. Meanwhile, heat 1 tbsp of oil in a large wok over high heat. Add chopped chiles, scallions, and sliced onion. Mix and stir fry for a minute. Then add fried chicken pieces. Stir fry for a minute together, then turn off heat and cover. Be careful of the fumes given off from the fried chiles.